Zambia : UPND says it will ensure the peace agreement signed with PF is implemented. UPND says it will ensure the peace agreement signed with PF is implemented. The -UPND in Lusaka says it will ensure the peace agreement signed with Patriotic Front, on Friday last week, is implemented. UPND Lusaka Province Spokesperson Ortis Bwalya says the party supports the move and will ensure that the message of peace is emphasized among their supporters. Mr. Bwalya was speaking in an interview with ZNBC News in Lusaka . He says the UPND is willing to work with the PF in the fight against violence. Mr. Bwalya says the two parties will be holding another combined media briefing to ensure the peace accord agreement is actualized. He has appealed to the police and the electoral commission of Zambia to ensure the mayoral elections are held peacefully. On Friday, last week, the PF and the UPND signed a peace agreement aimed at ending political violence among their supporters. The UPND women’s league have commended the move by youths from the PF and the UPND for coming together and addressing the violence that has characterized the by elections across the country. Speaking to ZNBC in an interview at the UPND Secretariat, UPND National Chairlady for Women Affairs Namakau Kabwiku said from the time the agreement was signed the political field has been peaceful with no acts of violence. Mrs. Kabwiku said it is gratifying to see the two big political party campaign side by side without attacking each other. She however called on the police command to deal with anyone who will go against the agreement regardless of their political affiliation. Mrs. Kabwiku also thanked the Minister of Home Affairs Stephen Kampyongo for taking a reading role to denounce violence before, during and after the elections. 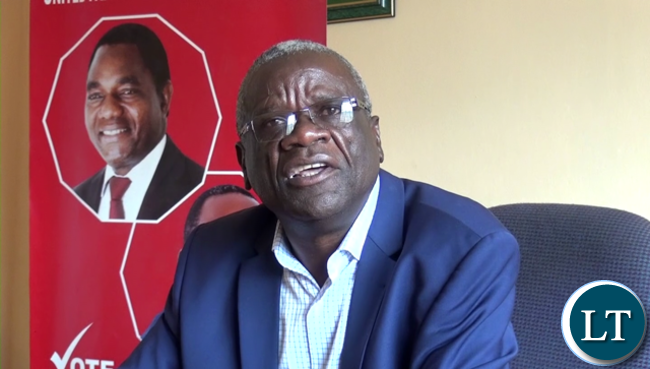 Meanwhile, UPND Secretary General Stephen Katuka said with the conducive campaigning that has been created by the two political parties, the UPND is confident of scooping several seats in the coming by-elections including the Lusaka mayoral seat. And Patriotic Front-PF- Youth CHANODA NGWIRA has condemned United Party for National Development -UPND- Deputy Youth chairman Gilbert Liswaniso for not completely renouncing violence. Mr. Ngwira says Mr. Liswaniso is courted by some section of the media telling the UPND youths to stand up and defend themselves once attacked. He was speaking in an interview with ZNBC news in Lusaka. And Mr. Ngwira said the peace pact which was signed by PF and UPND brings an end to political violence. He said all well-meaning Zambians must stand up and condemn Mr. Liswaniso’s statement on violence. But thus Chanoda Nwgwira is very dull. Liswaniso is simply asking people to defend themselves if attached. What Chanoda and other violent PF cadres should do is ask their thugs not to attack UPND members otherwise, the UPND will have to defend themselves, like Malcolm X said, by any means necessary! Upnd is just on lip-service NOT deep down on their hearts. They are too BITTER and HATEFUL. It’s just that PF as a party has CLEVER Strategists who always dance on upnd’s mind.upnd’s political psychology is full of RESENTMENT. Just ask ba Big Mkoshi Kambwili, & how the PFolice blocked him from exercising his democratic right under a plural democratic constitution that Zambia brags about. The PFolice allegedly told ba Big Mkoshi, “we received a call from high above to stop you gathering, & campaigning”. ONLY BA JONA CHAKOLWA IS ALLOWED TO CAMPAIGN FREELY IN ZAMBIA! Ask Ba Big Mkoshi, “Njebeni echo mulalila kunse”? ?